. :: dev.arqendra.net > oldies ::. This page hosts old projects which are not maintained anymore or old versions of current projects. Acrylic DNS Proxy Monitor is a frontend monitor for Acrylic DNS Proxy, a free personal DNS proxy server. C++ version (not maintained anymore, please use ADPMonitor v2 instead). KUpdater performs download of virus definitions update files for Kaspersky products from version 7 to version 9 (Kaspersky Anti-Virus aka KAV and Kaspersky Internet Security aka KIS). Useful to centralize virus definitions update files at one shared place on your network (reduces bandwidth volume). Useful also if you're paranoid enough not to let Kaspersky access the internet. 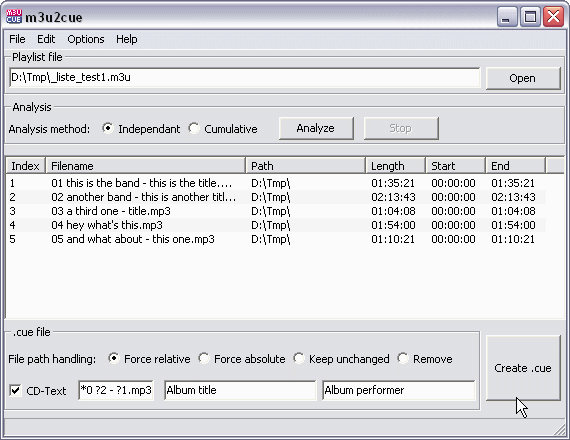 m3u2cue reads content of a .m3u file (list of mp3 files) and creates the corresponding .cue file (structure file to create an audio cd). C++ version (not maintained anymore, please use m3u2cue v2 instead). 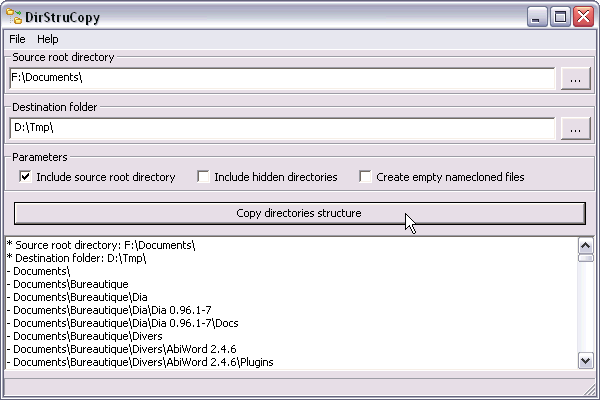 DirStruCopy allows to copy directories structure from a source path to a destination folder. Hence, only directories and structure are copied, not any file. ShMediaManager allows to activate/desactivate ShMediaManager.dll. ShMediaManager.dll is the Windows component which analyzes and inspects any multimedia file as soon as it is pointed in Microsoft file explorer. Unfortunately this component is also often responsible for file-locking problems which prevent to move or delete files while the dll hasn't ended its analyze yet. 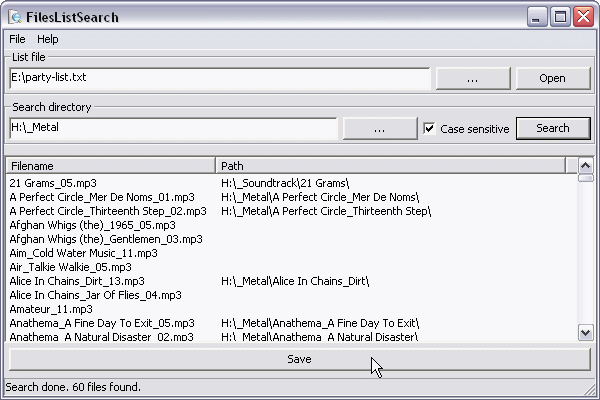 FilesListSearch allows to look for pathless files of a files list in a folder and create a new files list updated with path of found files. 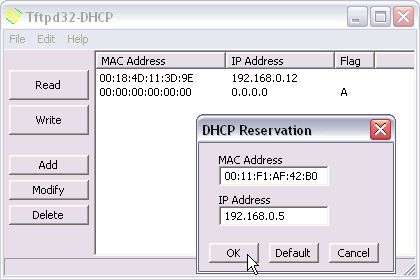 Tftpd32-DHCP is a frontend to manage DHCP reservations for Tftpd32 directly with Windows registry. FileContentObserver (namespace ArqCs) is a C# class which allows to monitor content of a file. Each time content is updated, an event is fired which holds update informations. Modifications are handled by byte blocks. The file content observer is aimed to run as a dedicated thread (making use of ArqCs.LoopThread). LoopThread (namespace ArqCs) is an abstract C# class whose aim is to simplify usage of .Net thread system in a loop-thread usage. - poll time is the time between 2 polls of the thread, which means the time between 2 wakeups, useful for the thread to know if it has been asked to pause or stop. ListCtrl (namespace ArqWx) is a C++ class which extends capacities of native wxWidgets listctrl. It is designed to work with wxWidgets framework, and adds some convenient functionalities, principally based on insertion and retrievation of value of specific types. Auto Resize JPEG is a Thunderbird add-on which allows to resize attachment images when sending an email. - reduce size of image files (emails > 5 Mb are generally blocked by ISPs). - give the image convenient dimensions for it to be visible directly in email client without using scrollbars. - Compatible with Thunderbird versions from v1.5 to v3.2a1pre (no plan to support newer versions, use Auto Resize Image instead). - Requires .Net framework 2.0 or higher (already embedded in Windows Vista or Windows 7). Please note that THIS ADDON IS NOT MAINTAINED ANYMORE: use Auto Resize Image instead. Thanks. I am not the original creator of this add-on, but the current developer/maintainer. Note it is also released on the Mozilla add-ons web site.